The need to conserve and to protect Earth’s greatest natural resource will never change, and we can all pitch in to help our planet. Jericho Water District aims to provide you with the resources and knowledge to help you conserve and manage your water – both at home and at your business. We need to work together to achieve sustainability and meet the mandate from the New York State Department of Conservation to reduce water consumption. The District’s daily demand for potable water fluctuates greatly. Daily usage during the winter months is approximately 5 to 6 million gallons per day. That satisfies all of the water-related needs for all of our customers. During peak summer months, daily demand for water skyrockets to approximately 38 million gallons. Water is our most precious resource – use it wisely. Let’s start today! Irrigation is only intended to supplement precipitation. Even though irrigation is allowed as of April 1, hold off on initiating irrigation until it is actually needed. How much water your lawn requires depends on whether it is in full sun or shade, on sloped terrain or on relatively level ground, and the time of year. Generally, in May and October your lawn only needs 1/2 inch to 1 inch of water per week. From June through September, weekly needs may increase to 2 inches. Make sure that your sprinkler’s time clock is adjusted accordingly and program each zone based on plant requirements, soil type and sun/shade exposure. Electrical storms can cause power outages which disrupt time clock programming and may cause sprinklers to be on more frequently and/or for longer lengths of time. Check sprinkler time clock settings frequently to ensure they are set according to schedule. Irrigation is most effective when there is less evaporation (early morning and/or late afternoon and evening) so your lawn gets full value from watering. We recommend sprinklers be programmed to go on later in the morning, 6:00am to 10:00am., or at night, 9:00pm to 12:00am. Sprinkler systems are prone to leaks that largely go unnoticed and can waste thousands of gallons of water. To mitigate this problem, systems should be inspected monthly. Check for broken lines and heads, clogged heads or heads blocked by new plant growth. There is a lot you can do to make your soil healthier so it can take full advantage of the water being delivered to it and minimize the use of fertilizers and pesticides. Test soil pH annually. Soil with a 6.2 to 6.5 pH is more drought and disease resistant. Applying lime will adjust the pH accordingly. Adding compost increases the soil’s capacity to retain water. Lawns aerated annually have a greater capacity to absorb water and applied nutrients. Review more information about irrigation and sprinklers on our In-Ground Sprinklers page. Sprinkling is prohibited before April 1 and after November 1. Sprinkling is prohibited between the hours of 10:00am and 4:00pm. Residents with even numbered and unnumbered residences may only water on even dates. 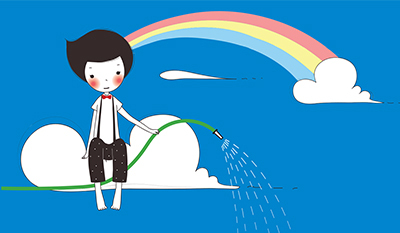 Residents with odd numbered residences may only water on odd dates. Sprinkling is prohibited during periods of rainfall. Hoses must have a shut-off nozzle that is automatically self-closing, requiring hand pressure on the valve to permit the flow of water. 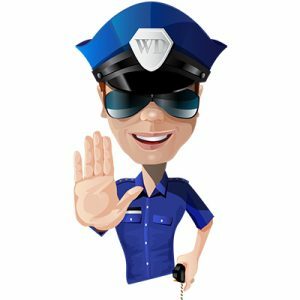 Jericho Water District restricts the hours that all commercial/industrial properties (apartment complexes, condominiums, co-ops, schools, HOAs, etc.) may irrigate to between 6:00pm and 12:00am on their designated odd/even dates. Check for Leaks – Become a Water Detective! First…check bathrooms! Toilet leaks can waste 200 to 1,000 gallons of water per day. Check every toilet for leaks by using food coloring or dye tablets (available from the District). Place dye tablets/food coloring in the toilet tanks, wait 15 minutes without flushing. If the dye has entered the bowl, it’s leaking, and it’s in everyone’s best interests to have repairs made immediately. Second…check your irrigation system continually. Run it manually once weekly and check each part for leaks including control valves, pop up and stationary sprinkler heads and supply lines. Third…if you can’t find the source of your leak, call a licensed plumber. Shut off outside spigots from inside the house. Open the faucet to drain the lines and leave the outside valve open. Disconnect and drain water hoses or bring them inside to prevent them from damage. This will prolong their lives. Ensure underground irrigation systems are turned off and winterized. This is better left to a professional who will remove any water and check for damage and broken heads. Insulate water pipes in unheated or under-heated areas to prevent freezing and subsequent thawing and bursting. Seal leaks in walls that allow cold air to reach interior pipes. Make sure meter pit covers are intact and securely locked down. Your meter pit cover should be level with the surrounding area and the meter should be 12 to 15 inches below to prevent freezing. If a pipe becomes frozen, bringing heat into that area should thaw it out gradually. 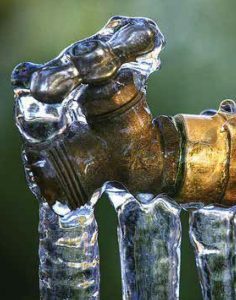 While waiting for it to thaw, locate the shutoff valve for that pipe or the main valve for the house. When the ice in the pipe melts allowing water to pass, you may discover you have a leak likely caused by ice expanding in the pipe and splitting it. Plumber time! Shut off the valve and make your call. Snowbirds should contact a plumber to winterize their homes. Turn the faucet off while you brush your teeth, wash your face or shave. Replace standard shower heads with low-volume heads or flow restrictors. Don’t run water before closing the drain and filling up the bathtub. Change your toilets to ultra-low flush models. Check your toilets regularly for leaks or plumbing problems. Don’t use your toilet as a wastebasket. Extra flushes waste water. Clean vegetables using water in a pan and a vegetable brush instead of running them under water. Wait until you have a full load of dishes to run the dishwasher. If you cannot wait for a full load to accumulate, set the water level to match the size of the load. Don’t let the tap run while waiting for water to cool. Fill a pitcher with drinking water from the tap and store it in the refrigerator. If you boil vegetables when cooking, save the water. Use it to make nutritious soups and sauces. Use a sponge mop when doing household cleaning. It uses less water than a string mop. It also takes less water to keep a sponge mop clean. Pre-soak grills, oven racks, etc. overnight. Wash them with an abrasive scrub brush or pad. 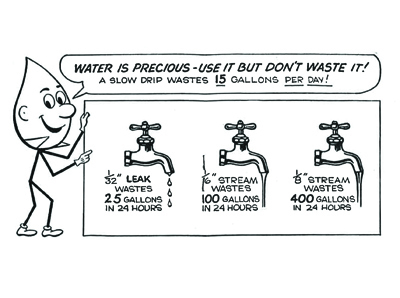 Use lots of “elbow grease” to minimize water use. Take steps to prevent drafts in the basement so pipes won’t freeze. Insulate hot water pipes to avoid wasting water while it heats.